We’re all big fans of Donut Games around TouchArcade, and have been for years. They were one of the earliest developers to put out consistently good games with both gameplay and controls that were perfectly suited to mobile, and always with a level of polish that so many other games seem to lack. We were blown away when they stepped outside of their typical arcade game comfort zone with 2014’s Traps n’ Gemstones ($4.99), a surprisingly clever Metroidvania platforming adventure. Since, they’ve released a few mini-game collections and a sequel to one of their earlier hits, but it looked like we were in store for more platforming action when they announced Vulture Island ($2.99), which launched this week. Well, if you were a fan of Traps n’ Gemstones and hoping for more of the same with Vulture Island, that’s not exactly the case. Yes, this is a complex adventure that will have you exploring and then re-exploring tons of different areas, slowly piecing things together to help you and your friends get rescued from the island that you’ve crash-landed on. Except, the soul of Vulture Island is more “adventure" than “platformer", which can be a bit shocking to those coming into the game with different expectations. The thing is though, if you go into Vulture Island with the proper expectations, this is one of the most interesting and unique games to come out in quite some time. 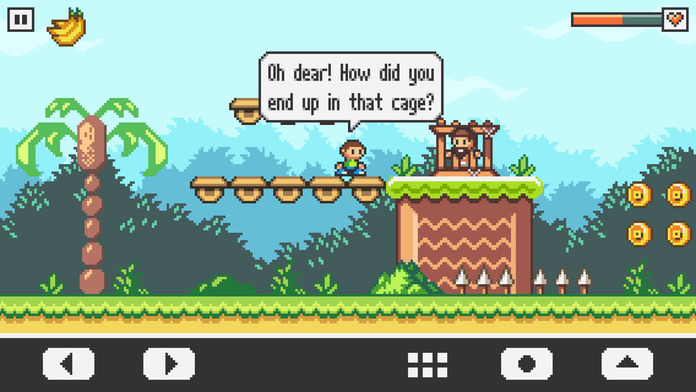 You’re (literally) dropped into the world of Vulture Island when your plane explodes and you crash land on an island. Your group of three gets split up, and the game is completely open right from the gate, which means you can travel to any location or switch between any of the characters from the overworld map at any time. There is practically no tutorial or guidance to help you, you’re left to choose which areas to run around and explore at any time. Eventually, you’ll come across an area or an item that you can use in a different part of the world, which might unlock a new part of an area to explore. And so it goes until you finally unravel all the puzzles and you and your mates can get rescued. The interesting thing is that this all plays out very much like a classic point-and-click adventure game. Plenty of obtuse puzzles and fetch quests pepper the entire game, and each point on the overworld map almost feels like a different screen from an old adventure game. Except, instead of pointing and clicking through each one, you’re running and jumping, platformer-style. It’s actually a very interesting way to portray an adventure game, and although it’s not the first game to do this, Vulture Island different enough from anything else on the App Store that it really stands out from the pack and deserves our nod for Game of the Week.